I realized that if I want a project to be interesting - which is needed for people to care and read about it or participate in it, it must be socially relevant. But `something like "socials talk about it", "those who have it consider it e-peen", "incites envy in socials"` is not a definition. It's weaseling around it, mostly because I failed to realize what make something relevant to socials in a game. I see now: something that gives character power or give access to exclusive content. Gear was something in old WoW. With proper gear you could pwn lesser geared players in PvP and you could do raids. Now PvP gear is largely normalized and even a drooling moron in quest gear can raid. He can do it in LFD "difficulty" on latest tier and on any difficulty on earlier tiers. Owning a region in EVE was similar: you could farm more ISK than in highsec and hostiles couldn't access services. Even if one could make much more money on the AH and the rats in the next region were just as good, it mattered to socials: "they have something that I don't and they pwn me if we meet". Many games have character power (though not surely with some point) but very few has exclusive content. League of Legends has, platinum and above games which you can't access without reaching proper rating. BDO has character power, but nothing exclusive. A strong guild can capture territories, but it is invisible to anyone who doesn't care. I literally don't know which guild owns Heidel or the nodes I use, because it's irrelevant to my play. If they'd lock me out of (or tax me badly) in Heidel and in the nodes, I'd sure care! Still, people care about their gear, so they care about BDO wealth, as evidenced by the instantly purchased pay-to-win market segment and my unlikely high hit count on the old BDO wealth posts. But it warrants no in-game project, just out-of-game guides. 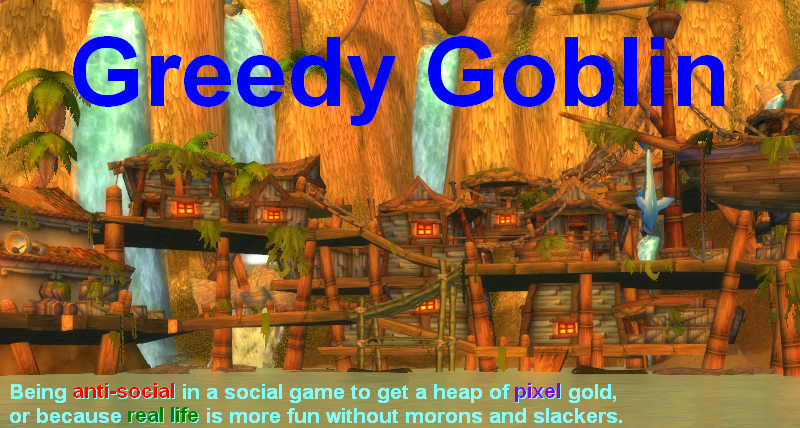 I can't start a "goblin guild". What would we do? Sit in Heidel and process together?! So I need to find a game where one can gain power over other players or can access to exclusive content. Then I can start a project to prove that you can do it faster by asocial means. Hmmm, :) sounds like your grasping @ straws dude, just come back to EvE and do something relevant. I guess there is nothing around like what you're looking for, and there will not be for a long time and for solid reasons. You're looking for a MMO, so anything as a niche is not relevant to you: well, game industry figured out well what younger generations, current/future player base, are looking for ... stuff like getting rewards just for logging in etc. are now the mainstream. People want to be the hero, without any effort (see Legion intro quests, you do nothing but being part of a cinematic and your contribution is totally irrelevant) ... they pay for it and game industry gives them that. Either you will change focus to niche games (they may be not relevant for your blog audience) - good old EvE (it is triggered? yes, like any other game) - or try upcoming games (I am sure people will be interesting in your thought on new titles). I don't see anything relevant in the near/far future. grand deeds may look good but also seem to be beyond the reach of most. A lot of appeal of the "beating the rigged system" and "money making" types of post is, that others can follow your story and have some success on their own. This was true for WoW, BDO and Eve money making, also for gaming the system in World of Tanks. Projects of this kind have the advantage to be individually verifiable. You do not have to believe that your ideas are correct, but one can verify that your methods work. "I want to destroy Goos because they are social and evil" can not repeated by a player. And it is too high a goal for most, even if they follow your steps. Philosophical posts may work at times to give background, but if there are too many, it easily attracts the "crazy" and "tinfoil hat" crowds. I guess Albion Online might be something close to that, when it launches. Everything is player made and it promotes competition over resources, so I'm sure it'll be something you canbuild a project on. OK, I will ask the dumb question. Why are you constraining yourself and your project within the confines of a MMO? There are plenty of opportunities for demonstrating a social supremacy elsewhere. Isn't the current fake news debacle just another example of "socials" being trolled and manipulated? Perhaps you should review the setting for your project because basically you have proved your point to those that choose to listen in at least three mmo's. @lubote kong: I've tried World of Tanks and League of Legends. They aren't MMOs and they are rigged as hell. @gevlon I was thinking of something outside of the game industry altogether. Given the post, it seems you are necessarily looking for a game where people will engage in un-fun activity of getting pwnd to get access to restricted content. Sadly, there is too much content nowadays for anyone to really fight over pieces of it. This only really happens in niche communities, invested in their content to ridiculous extents. These communities constantly fly under your radar for being too small, though. @maxim: League of Legends and World of Tanks are such, half of the players are losing the next match. Too bad that they are rigged as hell. But the format is far from niche. You are correct that in competitive games people will do apparently unfun stuff to reach restricted content. It is interesting how i don't think about losing competitive ladder matches in games like Starcraft as "unfun" and "getting pwned". Gonna have to reflect on that. On another hand, i must point out a few things that you may not like. 1) You have only proven LoL is rigged by your own very narrow definition of "rigged". 2) You have also proven, at least in my eyes, that the definition of "rigged" you are running with will result in you finding pretty much any competitive game "rigged". At this point, this seems to be your bias. You got lucky with WoT (that is actually rigged), resulting in a case of "paranoid doesn't mean not stalked", but this simply wasn't the case with LoL. As a result, i can't see you enjoying any competitive game, because you simply do not enjoy the process of getting stuck in a rut and then getting out of it through the process of gittin' gud (which is the core of competitive gameplay). You'd rather blame the "dev rigged ELO hell". So yeah, you are right that competitive games might have what you want. But competitive games themselves are not what you want. @maxim: so you claim that "buy new champion = get free win" is "rigged"? I do NOT claim that Starcraft is rigged. I don't like high APM games, but this doesn't devalue Starcraft. I think you mean "not rigged". Yes, i'm claiming that 1 new win in below-gold level for a new champion is perfectly acceptable. The more important claim, however, is that you seem to not be able to properly appreciate competitive games. "I don't like APM games" is a part of this. There is no inherent problem with this. However, physicality like APM is one of the few ways left to get a lot of people really passionate about exclusive content (because they want to experience the high level physicality. "What would it feel to actually hit a homerun from a pro pitch" kind of feeling). I'll have to do a translation summary for english speakers later, but I believe Gevlon knows French ? How about a free win in the World championship finals? I do NOT question the value of APM games. I just don't like that genre. @Anon: I don't speak French, nor most of my readers. I know it's early access, but Ark Survival Evolved is perfect for what you want. You can gain power over others on server by outteching them or building alliances. I do so by having a major tribe do my bidding by breeding dinosaurs they want to the highest level. I play antisocially on my server with my wife. We stay out of chat and mastermind tribe takedowns by preying on the stupidity of mass tribes. I am even alliances with a large I plan to double cross as they've allowed entry to their base. I've identified weak spots, take pictures of base layout and even allowed to rest my ear dinosaurs in their Dino pens. They want to be cool and do various social things to get more people to join. Two months of M&S have left them resource drained as the M&S want to ride fun Dino's but unconcerned of maintenance costs. Soon we will strike and wipe them from server dominance of 3 months. All because they killed my level 32 Raptor when I was noob. My objective answer to your query is that slippery slope fallacy is among the logical fallacies for a reason. Not all free wins are made equal and quantity of free wins does, in fact, change the quality of the situation. My subjective answer to your query is that i would have an inverse correlation of the impact of new champion on matchmaking benefits with player's matchmaking rating. 2 free wins for 1 purchase is maybe okay if we are talking bronze-silver leagues, 1 free win is okay in gold, some benefit but not guaranteed win is okay higher, eventually no benefit at very high levels. That's all just subjective ballparking, though. Also please note that LoL's system is harsher than this. As per your own statistics, you don't actually even get a single guaranteed win at gold level. Definitely no free wins in WC finals (but there is no ladder matchmaking system there, so why is that even a question? ).